The Smithtown Highway Department building has been renamed. 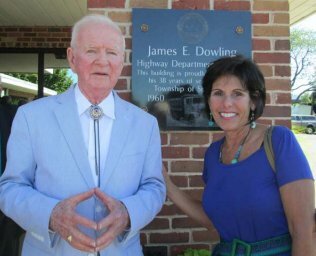 Smithtown, NY - August 27, 2013 - The Smithtown Highway Department’s building was renamed after former Highway Superintendent and St. James resident, James Dowling. Family, friends, present and former employees and local elected officials attended the ceremony at the highway department. Suffolk County Legislator Lynne Nowick who has known Mr. Dowling for most of her life said, “This is a wonderful occasion and Jim Dowling is so deserving of this honor. The Smithtown Senior Center is named after my father, former Town Councilman Eugene Cannataro, so I understand how meaningful this is to him and his family.” “I’m sure my dad is smiling down at him,” Legislator Nowick added. Central Veterinary Associates, P.C. Takes Care of "Mr. Popper's Penguins"
BETHPAGE FEDERAL CREDIT UNION FLIES LONG ISLAND NOT-FOR-PROFITS TO WASHINGTON, D.C.
Subject: LongIsland.com - Your Name sent you Article details of "Suffolk County Legislator Lynne C. Nowick Congratulates James Dowling on Highway Building Dedication"